« Nutella Crinkle Cookies…and I Survived a Blackout! I’ve always read and heard great things about using a grill pan, but I’ve been too scared to use one. Why, you ask? Simple. I have a relative who is a huge fan of the grill pan, but everything they’ve ever cooked on it has come out dry and overcooked. [Let us all take a moment now to say a collective prayer that said relative doesn’t actually read my blog.] Let’s go on. So I left the grill pan in the back of the cabinet, opting instead for the outdoor grill, the George Forman grill, or in a pinch, the broiler. Then the blackout happened. And for three days I faced very limited cooking options. 30 degrees and a foot of snow meant no outdoor grill, the lack of power eliminated the possibility of using the George Forman or the boiler, and so, out of sheer desperation, I pulled out the grill pan, tucked a flashlight under my chin, and proceeded to grill some chicken. I was astonished at how moist and delicious the chicken came out. So the dry chicken was due to poor grilling by my relative, not due to the grilling method. How shocking. Yeah, it really was that dark. This picture was with about 10 candles, a flashlight and my iPhone camera flash! The chicken was so delicious, I had to make it again and photograph it properly, so I could share it with you folks. The list of ingredients may seem a little long, but don’t let that daunt you. This chicken really has an incredible flavor, and is a lot quicker to throw together than the list would indicate. Hey, I managed it in the midst of a blackout! Combine all ingredients except for chicken in a bowl, stir to combine. Pour over chicken and let sit for at least an hour. (If you don’t have time you can grill it immediately, but the longer the chicken marinates the better.) When ready to cook, place grill pan on flame and let it get very hot. Spray with Pam. Place chicken on grill pan and cook on each side for about 3-5 minutes, depending on the thickness of the piece. (I cut my pieces down the middle to produce two pieces of chicken that are half as thin, so they cook a lot faster.) Watch the chicken carefully to ensure it doesn’t get overcooked and dried out. You can also grill the chicken on a George Forman grill or in the broiler. 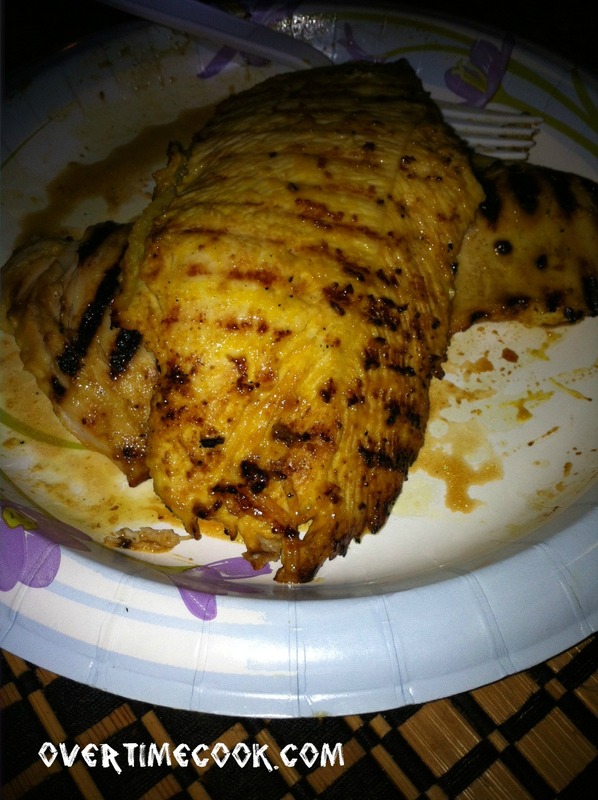 * I used a pound of chicken, but the marinade is enough for up to a pound and a half. If you are cooking more than that, double the marinade ingredients. ** I have gotten very into using Mirin for asian flavored dishes, but if you don’t have it, you can skip it, or increase the vinegar and honey quantities. Your chicken is fantastic and it is also great cold. I love the way you turned a negative into a positive. Your praayers must be worKing-i managed ro surpress a laugh while reading this even though mentioned relative was sitting next to me. LOL don’t we all know someone who has turned us off perfectly good food like that! So what’s the grill pan secret? I’d love to know because I have no barbecue and no Forman. This sounds wonderful and I like the commentary on the grill pan. I have had similar problems, but my remedy was to make sure the chicken was pounded out flat and then it seemed to cook a little more evenly and not get dried out. 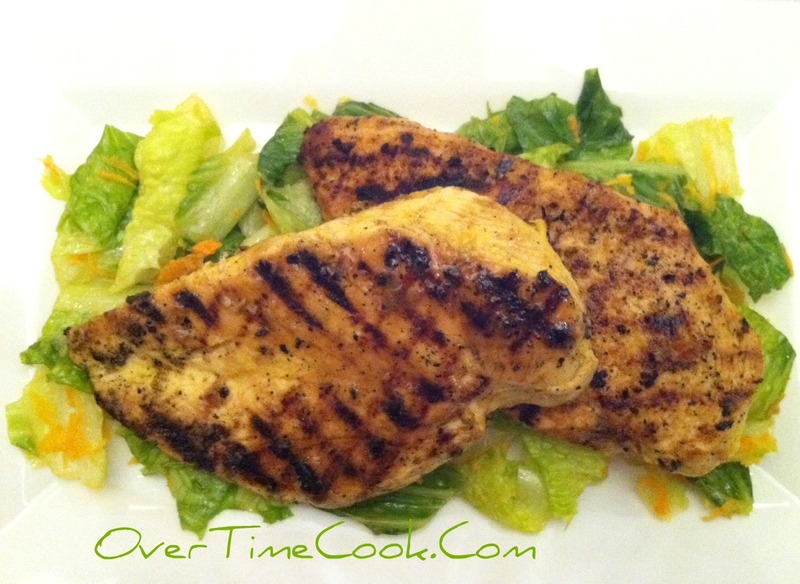 I am always looking for different marinades for grilled chicken and this sounds great! Wow- this chicken is delicious!!!!! Thanks for the awesome recipe. Where do I find some of these ingredients? I really want to make this for Shabbos! It sounds so good!